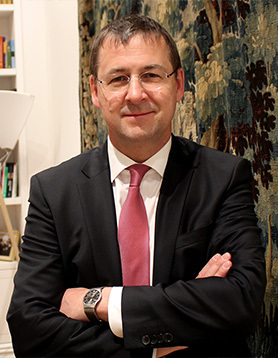 David Gill has had a remarkable journey to becoming Germany's Consul General in New York; most notably, he held the venerated position of State Secretary and Chief of Staff for former German president Joachim Gauck during the course of his term. The Consul General's foreign policy acumen and international relations skills attained from his previous job equipped him with an extraordinary level of dexterity and aptitude in interacting with high-level government officials and delegates. Gill is very well-accoutered and accomplished in ways that are essential to successfully meeting the demands of this honorable profession with all its intricacies in one of the most bustling cities in the world. Diplomatic Connections: How and when did your career in diplomacy begin? Consul General Gill: Technically my diplomatic career started only in 2017. Finding my way to diplomacy was as follows: I grew up in a rectory in Herrnhut in the eastern part of Saxony, in the former German Democratic Republic. For political reasons I was not allowed to attend a public high school nor university. After an apprenticeship to become a plumber, I first attended a high school run by the church that was not acknowledged by the communist regime. In 1988, I became a student of theology. In 1990, I initially was Chairman of Normannenstrasse Citizens’ Committee at the headquarters of the Ministry of State Security (Stasi) and then Head of Administration of the Parliamentary Special Committee for the dissolution of the Stasi. After the German reunification, I served as Spokesperson and Head of the Research Division of the Federal Commissioner for the Stasi-Files before studying law, in Philadelphia, amongst other cities. After holding positions with the Federal Ministry of the Interior and with the Office of Commissioner for Data Protection and Freedom of Information in Berlin, I was the Deputy Representative of the Council of the Protestant Church in Germany (EKD) to the Federal Republic of Germany and the European Union for eight years, it was there that I took my first diplomatic steps. During the term of Joachim Gauck as Federal President of Germany from 2012-2017, I served as State Secretary and his Chief of Staff, an occupation which was highly diplomatic, with many state visits to prepare and conduct as well as many diplomatic colleagues who served at my office. Diplomatic Connections: How did you come to be a diplomat in New York? Consul General Gill: In my former capacity as head of the Federal President's Office, foreign policy became increasingly important to me and I enjoyed building, nurturing and strengthening relations between Germany and other countries. That was one of the main motivations that led me to join the Foreign Office. Initially, I was not even focused on serving in the United States, but over the past 20 years, I have not only maintained professional relationships with America, but also private ones - my wife is American. So, I am very pleased that the German Ministry of Foreign Affairs sent me here, where I have been leading the German Consulate General in New York since August 2017. Diplomatic Connections: What is the anticipated length of stay for your particular posting here in New York? Consul General Gill: Usually, the term in a post as Consul General is four years. So I am looking forward to a few more years of working on German-American relations and friendship. Diplomatic Connections: How do you define the mission of a consulate in general and for your nation specifically? Consul General Gill: In general, a consulate should support building and maintaining a mutually beneficial and respectful relationship between the delegating and the hosting nation by strengthening ties and reducing boundaries. There are three major fields of responsibilities: First, the consular duties of issuing passports, visa, etc. Second, it is our responsibility to explain Germany in our host country – such as the political system in Germany or the beauty of our country – in general, to make Germany known in the United States. Third, we try to understand our host country in order to explain to our politicians and the people in Germany how this country works and what its issues in politics, economy, culture, etc. are on a day-to-day basis. In summary, the German Consulate General is in charge of explaining Germany, understanding America and fostering successful discussions and exchange – that is our mission in our area of jurisdiction. Diplomatic Connections: What is its role in New York versus another city in the United States? Consul General Gill: The United States is the country with the most German Consulates General worldwide due to the fact that we are very important allies and partners. Many Germans live here in the United States. In addition to the Embassy in Washington, we have eight Consulates General. The Consulate General in New York has a special role – first of all, New York is an important economic, cultural and political hub with many visitors from Germany. Many German companies invest here and there is a wide-ranging exchange of cultural programs. Additionally, all the major Jewish organizations have their headquarters in New York – one of our main tasks is to network and to partner with them. Diplomatic Connections: How is the consulate organized specifically in New York? Consul General Gill: The organization of the German Consulate General is similar to most foreign missions. It is divided into five sections: The Consular Department staff offer consular and legal assistance for U.S. residents and German citizens. The Political Department gives the German government a comprehensive view of political developments and additionally cooperates with the Jewish institutions based in New York. In our Economics Section, we support German-American business relations by connecting our partners, in both Germany and the United States, with chambers of commerce, conventions and trade fairs, as well as German companies located here in the United States. Our Cultural Department provides links to German cultural organizations, connects with German language education programs and organizes a variety of concerts and exhibitions to support German artists here in the United States. Finally, our Press Section supports all of our departments with their public diplomacy work online – both on our website and social media platforms – as well as through their connections to German journalists located here in the United States. Diplomatic Connections: What region does the consulate represent for the northeast corridor? Consul General Gill: The Consulate General in New York represents the German Federal Republic in New Jersey, New York Pennsylvania, Fairfield County Connecticut, and Bermuda. Diplomatic Connections: How is the economic collaboration with the United States? Consul General Gill: Germany enjoys close economic relations with the United States – it is one of the essential pillars of our bilateral relations. The United States of America is Germany’s biggest economic partner outside of Europe. Vice versa, Germany is the most important economic partner in Europe for the United States. Worldwide – in terms of the total volume of U.S. bilateral trade including imports and exports – Germany remains in fifth place, behind China, Canada, Mexico and Japan. Our bilateral trade amounted to 172 billion dollars in 2017. In addition, many German companies are very active in investing in the United States: You can find many of their American headquarters in our district – especially in New Jersey. Almost 700,000 jobs are created by German companies in the United States. All the major German car companies produce cars in the United States - such as BMW, with its huge plant in South Carolina, which is the biggest American car exporter by value. We have a very active German American Chamber of Commerce. Moreover, many German companies reinforce the implementation of dual education – e.g. by offering apprenticeships. Ties between the United States and Germany span years, decades and even centuries. This partnership will be of utmost importance in the future, too – for freedom, security and economic success in both countries. Diplomatic Connections: What is the role of the consulate when you have elections in your country? Consul General Gill: Germans who live permanently abroad and no longer have a residence in Germany may still participate in Federal elections and European elections. In Germany, unlike in other countries, voting at the consulate or online is not possible. As a German citizen who lives abroad, you have to vote by mail. Hence, our most important role during elections is to inform Germans residing in the United States how to exercise their right to vote. In addition, we answer questions from interested U.S. politicians, journalists and citizens in regards to the elections. Diplomatic Connections: What services does the consulate offer to your country’s nationals residing in your district as well as visiting tourists? Consul General Gill: Our most important, and by volume most common, duty is issuing passports to Germans who live in our area of jurisdiction. Every year about 5,000 German passports are issued in our district – meaning 5,000 Germans, who live in our district, need a new passport. Since passports must be renewed every ten years, there are approximately 50,000 Germans who live in our district – plus or minus those who might have lost their passports. In addition, there are other services that we can offer to the Germans living in our district such as certifications, notarizations, birth registration, and certain legal support. Diplomatic Connections: How does the consulate participate in the cultural and touristic promotion of your nation in the United States? Diplomatic Connections: How can the consulate help those who are not your citizens planning to travel to your country? Diplomatic Connections: What would the difference be if you were to make suggestions for a tourist versus someone going there on business? Consul General Gill: There would be no significant distinction. Germany is worth discovering and traveling through. It offers a long and interesting history as well as a beautiful countryside with a diverse landscape from seaside, to vast expanses of forests, to mountains, to old cities and their historic town centers. Even on a business trip there should be enough time to visit a museum or a Biergarten to enjoy a beer after work. Diplomatic Connections: Are there any upcoming cultural events organized by the consulate? Are they open to the public? Diplomatic Connections: If you had a message for our readers specifically concerning your country, what would it be and why? Consul General Gill: There is a quite common picture of Germany here in the United States, but there is far more to discover than just beer, bratwurst and pretzels. It is much more diverse, so come and find out – the German Consulate General is pleased to help.